Sorry this post has been slow in arriving but due to circumstances I didn't see the MotoGP race till late and I wanted to mull over the race before I posted. It was a very interesting race for several reasons. The issue that seems to have provoked the biggest debates amongst the fans is whether Rossi has made a mistake moving to Bridgestones. It was noticeable that both Rossi and Hopkins started to slip backwards at the same stage of the race and that they were the only 'stone runners at the pointy end. But does this mean that Michelin have got the Japanese tyres beaten or does it indicate that Estoril is not a good track for the Bridgestones? I suspect the later. I also think it's too early to judge Rossi's move. If anyone can prove the critics wrong it's Rossi and we may just see him winning on those "mistake" tyres. So what's happening to Ducati? Stoner had another terrible weekend even to the point where he was having to stop components falling off his bike! I think there were two glimmers of light in the gloom for the Duc boys though, Estoril isn't their kind of circuit and Stoner's late charge to sixth was pretty impressive. Casey will be himself next round, you'll see. As for the rest of the Ducati riders at the back of the field I just can't understand why they can't ride the Desmo, is it really that harsh that only Casey can ride it? I was reallly pleased to see Hopkins up with the lead boys again, he was riding the rims off that Kwak, hopefully he can develop that machine to become a regular podium visitor. What happened to West though? Hopper in fifth and Westy stone cold last? Oh dear. Again I think that James Toseland did a magnificent job on the Tech 3 Yamaha. Seventh is no mean feat on a track he doesn't know. Now he has the new engine look out! Excellent ride by Edwards too. Of course the star of the show was Lorenzo. What an amazing ride. 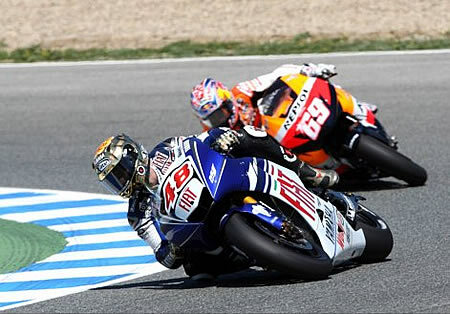 Pole position, did a Rossi on Rossi and held of Pedrosa till the end of the race. I knew the kid was going to be good but at this rate he will be all conquering. Lorenzo seems to be a powerful force indeed, doesn't he? I have to disagree about Ducati though - there really are serious issues for them to get sorted out around the 2008 bike, unless China proves me wrong. It was great to see Hopper back up at the sharp end - perhaps he can do some damage in China too! Hi Rob, lots of people are saying that Ducati is having serious problems, maybe I am being too optomistic. I think in the end I'm just glad that it doesn't look like it will be a walk over this year for anybody. I thought Rossi was back in old form but then look what happened. Still, though, third at that level isn't too shabby, huh? I'd only be in, oh,maybe last place or so! As an American I've been disappointed in Nicky Hayden. Some people say the bike isn't right but look at Danny. There's also those things like washing the front wheel out. My impression is that he's still not over himself. He's going to have to realize that he needs to just knuckle down and dig for it. That's just my feeling but I may be judging him too harshly. Do you have the schedule for the rest of the year you could share here? Nicky eh? He has struggled to find the consistency that led him to a championship in 2006. I think it's a shame because he can be a spectacular rider but is Hayden's sideways, tyre smoking style outdated in the era of traction control? I suspect so. I hope he does find his mojo again as I like the guy a lot. I do think he works hard though Irondad. As for a full schedule it can be found here. happy birthday! you better get out and start getting some dates because the days are ticking away.... do you REALLY want to be stuck with me?? ;) I hope you have a fabu birthday! Oh for the days when I used to have time to watch the bike racing before wife and three kids. Seriously I must make more time to watch MotoGP but it'll probably just make me miss my bike more. Top write up but a bit behind the times, geezer. Hope all is well and pull your finger out or I'll have to start writing stuff on our Blog. Now that would be very bad! What was it you wrote on Gary's blog once? Checks his watch, glances around, where is everybody? Something like that. Come on, dude. I've missed several GP races and was counting on you to let me know what happened! Hey Irondad, I have sub-contracted out my MotoGP write ups (to my little brother) and the goods just don't seem to be forthcoming. I'll chase him up again. Gateway Packaging, Australian owned and operated, is committed to continuous improvement and adaptability, and will remain true to the core values and mission, of providing a gateway of integrity for businesses, to a world of packaging solutions, products and services. Gateway Packaging have become long term supply partners to renown corporate retail giants, timber and steel fabrication and supply merchants, logistics and warehousing service providers, commodity manufacturers and large scale distribution businesses. Nice post, we are big fan of racing car.